A synchronous high torque range of timing pulleys and belts is one of the latest ranges to be added to their already extensive power transmission and gear products selection by Ondrives Ltd. These pulleys and belts start at 5mm pitch as standard and increase to 10mm. Belt widths start at 10mm and increase to 50mm. The pulleys are aluminium with zinc plated steel flanges but other materials are also available on request and are centre drilled or pilot bored. The belts are specially formulated from a steel reinforced polyurethane and have a high power metric pitch AT profile with trapezoidal toothform. There are a number of options also available on certain belt lengths such as anti-static, coloured, machined, ground and punched belts. Other optional extras also include backings, brush belts, increased power versions, Aramid (Kevlar®)tension members and special polyurethanes. A new Generation III version is also available for the AT5 and AT10 pitch belts, these are manufactured from a very high power metric pitch AT profile with trapezoidal toothform, composite PU carcass and bifilar 'S' and 'Z' twist spirally wound tension members. 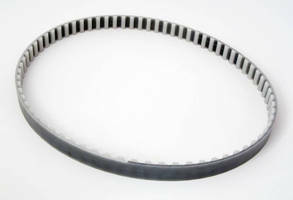 These are the latest timing belts with high performance characteristics which will suit almost any application where it is necessary. The 5mm Gen III version is available from 10mm, 16mm or 25mm widths and the 10mm pitch versions are offered in 25mm, 32mm and 50mm widths. These are also, surprisingly, available off the shelf and therefore customers can try these immediately. Open lengths belts are another version in this high torque range. These are single sided joined belts in steel reinforced polyurethane. The usual widths are available for both pitches with 75mm, 100mm and 150mm on request. Optional extras are also available for the open length belts, being E-tension members, special polyurethanes, nylon facing (tooth and back), transport backing (up to 100mm wide), anti-static, coloured, machined, ground and punched belts and mechanical joints. Unplated aluminium clamping plates are also available for use with the AT type belts where needed. Ondrives Ltd, Foxwood Industrial Park, Foxwood Road, Chesterfield, Derbyshire, S41 9RN, UK. Keyless Locking Assembly handles torque up to 50,000 lb-ft.